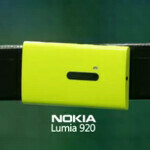 Nokia is really trying to get owners of other flagship models to switch to its own flagship handset, the Nokia Lumia 920. To prove its durability against the Samsung Galaxy S III, the Finnish manufacturer turned to America's National Pastime. Both handsets were strapped in place as a pitching machine tossed fastballs at the phones. The first model beaned, the Samsung Galaxy S III, not only suffered a cracked screen, but the phone would not turn on after taking the impact of the speeding baseball. The Nokia Lumia 920, on the other hand, acted as though nothing had happened. In fact, there was not even a scratch on the device. Looks like a Home Run for Nokia while Samsung struck out. Nokia has been rolling out its new #switch campaign and just the other day, we a showed you the accompanying television ad that will appear worldwide. lol, if s3 survived it, why not 920? You compare an 8-mos.old phone to 3-mos? What a dumb comparison. then tell me how many lumia 920 has been sold in the same period?? still the galaxy sell a lot more.. So you were duped then by Samdung. Makes profit for a cheap made phone, yet Nokia is the most durable around and cheaper by $100 to SG3. Vista8? Nonsense. It's easy also for me to say I hate the old MySpace experience in an android phone. Nexus is just wearing different underwear with holes at the bottom. Another zombie from Android camp. That's true, isn't it MS Nokia are both only shot at getting back into the race, this situation like no company would like to be in.. Unfair comparison unibody vs detachable back cover. Gorrila glass vs ..... What a big joke..
Unibody also describes the design of the frame, e.g. my HTC Sensation has a unibody chassis but the back and sides come off as a separate piece. The 820 survives many of the sake tests and its frame and body pieces fit together in a similar fashion. Unfair? Then why S3 is more expensive? Quadcore Exynos CPU not typical commercial crap dragon Adreno 225 which is outdated, no SD card, no system wide file manager no lock screen shortcuts audio output no user replace battery no radio . My dual smokes you quadcrap. Stop hiding on specs. I got 32Gig, no need for SD card where I have 25G in skydrive, 5G in Gdrive, 10G in dropbox. Stop living in primeval time, everything is in cloud. Why do I need file mgr? I can easily manage in cloud. I have evrything you have plus more. Now, do you have better camera? Wireless? How do you use your phone outside the street at -15C cold? I bet you have to dissect a hole from your glove. Funny you're proud of your plastic phone. I'm sorry but this video looks like a bunch of bulls**t. The S3 was clearly still recording after being hit while dropping, don't know what they did other than "tap" the broken glass. No continuous shot of it dropping from a different angle. Also, after that whole issue with OIS launch, it's kind of hard to believe anything Nokia advertises. Whether the device is more durable or not, the OIS launch was what screwed them over and I believe advertising like this is just hurting themselves more. People don't like to find out they're being cheated on/bulls**tted and people are starting to notice this with Apple. Of course you do. Is that why the word "nokia" is in your username? Go check out his profile, he doesn't mention the device he owns which supposedly is the Galaxy S3 and he only wants a Lumia 920, which smells like a troll to me. Behave well and write with more respectful way.. I'm not afraid from you to say what I don't have. Android crap is lucky to have a headstart by years. Put them in the same date release and Android will easily be thrown to the garbage bin. Besides mobile OS customer satisfaction in Windows phone is higher than Android, and that is a fact.